The Gmail Promotions tab continues to cause a stir amongst email marketers, though exactly why is misguided. You see, when you google “gmail promotions tab” you get 4.9 million results, and the top result is about how to keep your emails out of the Promotions tab. The problem is, you should be doing everything you can—which is essentially nothing at all —to keep your marketing emails in Gmail’s Promotions tab. Here’s the thing: five years since Gmail introduced the tab system, many marketers still wrongly believe the Promotions tab is akin to the spam folder. Likewise, many continue to blame the tab for drops in their open rates. In this article, I want to bust these myths with hard evidence—actual survey data collected from Gmail users. We’ll also explore why Gmail’s Promotions tab is the best place for your marketing emails, and why trying to manipulate tab placement is a waste of time. Back in 2013, Gmail had a dream: to help people deal with email overwhelm. With the average office worker receiving 121 emails a day, and this figure expected to reach 140 in 2018, they could see email was becoming a growing problem. Without some kind of intervention, it would get harder and harder to reach inbox zero. So they rolled out the tab system to help users organize their inboxes into five different categories: Primary, Social, Promotions, Updates, and Forums. Gmail’s tab system provides five categories for sorting email. Here’s how it works: when an email lands in a Gmail inbox, it’s automatically placed into the appropriate tab. Emails from people you know will land in the Primary tab while marketing emails will show up in Gmail’s Promotions tab. Immediately, marketers panicked and started predicting the end of email marketing. A rather melodramatic reaction if you ask me, but it was somewhat justified—Gmail has 20% email market share and marketers feared their 1.2 billion users would only check the Primary tab and ignore the others. So marketers got to work looking for ways to hack Google’s tab algorithm so their promotional emails would appear in the Primary tab and not Gmail’s Promotions tab. The tabs were automatically enabled for all Gmail users when this feature was launched, but over time there has been a steady decline in usage as Gmail users have learned how to customize their tabs and even turn them off. According to a Return Path Research Report surveying over 1,600 Gmail users, one in three users still use tabs. This equates to a 66% drop in tag usage since 2013. Many Gmail users have simply opted to return to one centralized inbox, where all email is delivered to one place. With 75% of Gmail users checking their email on mobile, they simply don’t see the tabs because the Gmail app doesn’t display them. Instead, all emails, including marketing emails, are mixed in together. The survey also found that of the 33% of users who still use tabs, 45% of them check Gmail’s Promotions tab every day. In other words, they treat it as part of their inbox, which, of course, it very much is. Further, the survey found that 19% of Gmail users check the Promotions tab several times a day, while 70% check it at least once per week. The misconception that Gmail’s Promotions tab is basically another spam folder is just not true. The reality is Gmail users who have chosen to stick with tabs simply like having an organized inbox. They appreciate that their marketing emails are automatically sorted into their own tab where they are easy to access, enabling users to quickly find and act on promotional offers. Similarly, the myth that Gmail’s Promotions tab has led to a drop in open rates for marketing emails is also not true. Constant Contact monitored its customers’ open rates in the two months immediately after the tabs were launched and did find there were small decreases as people got used to the change. However, since 2013 there has been no evidence to suggest the tabs have had a significant impact on email marketing. As email marketing specialist Tim Zetta highlights, the read rate for emails in the Promotions tab is 19.2%, which is on par with industry benchmarks and only slightly less than the Primary tab (22%). Let’s run through why you should leave your marketing email alone and let the Google algorithm do its work. The read rates for marketing emails for most industries before and after Gmail’s Promotions tab was introduced didn’t change all that much. According to another research report from Return Path some industries like entertainment, furniture, home improvement, kids and babies, pets, and restaurants experienced an increase in read rate. Likewise, many industries saw an increase in deliverability rates, with fewer emails sent to spam, as well as fewer spam complaints. The thing is, users who use tabs have come to expect marketing emails in Gmail’s Promotions tab. So when messages are not sorted into the expected tab and your subscribers can’t find your email where it’s supposed to be, they are likely to miss it. There’s nothing worse than a chaotic inbox. I’m one of those people who can’t stand notifications, so when I see an unopened email in my “Unread” inbox on my phone I have to act on it. And that means either opening it (and then reading it later), deleting it, snoozing it, or archiving it. With tabs enabled, I can quickly scan through family and work emails in the Primary tab when I’m using my laptop, leaving emails in the Promotions for later in the day, usually when I’m relaxing and watching TV after dinner—and feel like checking out sales online. 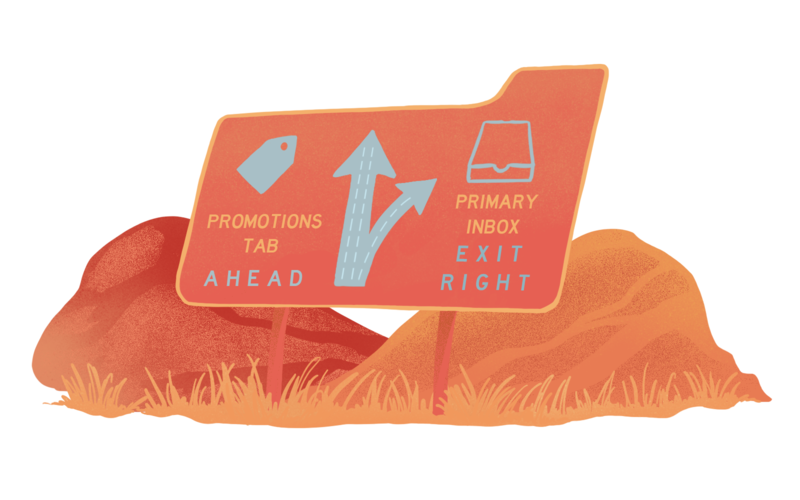 Thanks to Gmail’s Promotions tab, your emails won’t be overlooked in the inbox when a customer is trying to sort through work emails. Instead, when a subscriber goes to the Promotions tab they’re in more of shopping mindset and receptive to your offers. Without the distractions of other emails, they’re able to focus on your email and more likely to click-through because they’re ready to convert. There’s a lot of “expert advice” out there sharing tricks about how to sneak your emails into the Primary tab. My advice: Don’t risk it. Basically, you’re left with a plain text email. Without your branding and links to your site, you’re missing the key elements and content that is instrumental in accomplishing the objective of your marketing campaign. So if you’re dead set on getting your emails into the Primary tab, you need to ask yourself if the trade-off is worth it, particularly if you’re attempting to drive traffic back to your site with something that looks like an email from someone’s grandma. Plus, no one knows how Gmail’s algorithm works—or how it will be updated in future—so you’re efforts might not even work. Think of the Primary tab as someone’s home, where family and friends are welcome. When your marketing emails land in that tab tucked amongst messages about plans for Thanksgiving and upcoming travel plans, it will feel like an annoying door-to-door salesperson or, worse, someone trying to break into your home. The inbox belongs to the user, not the marketer. So instead of trying to force your emails into the Primary tab where they don’t belong, stay focused on creating email campaigns that deliver value—and your subscribers will happily click on Gmail’s Promotions tab to find you. Manipulating your emails to look like friendly messages from a friend will only annoy your subscribers if they feel like they’ve been tricked into opening your email. If they think they’re being sketchy, they’ll unsubscribe or, worse, mark your emails as spam. So you’ve got to ask yourself, do you want to look spammy just to appear in the Primary tab? The fact is, complaints are much more damaging to your reputation than having your emails appropriately categorized. Return Path research has found marketers have been largely unable to convince Gmail users to move their messages into the Primary tab. 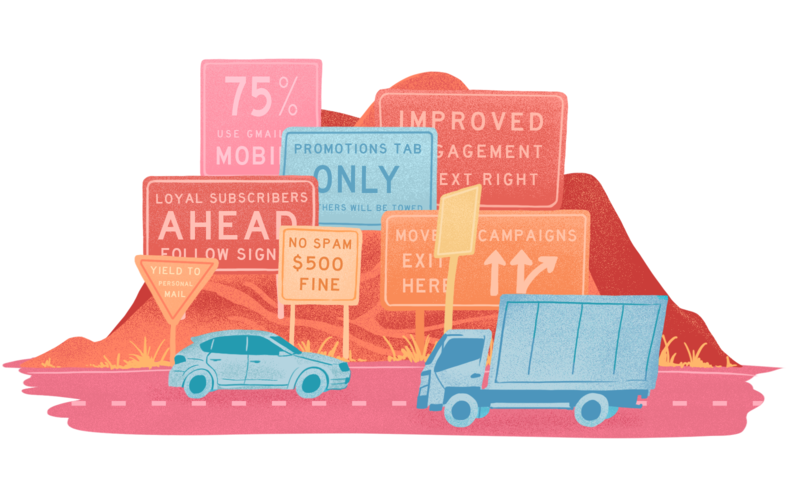 To measure this tactic’s success, Return Path monitored the delivery of marketing messages sent to the subscribers of major retailers’ “move me” campaigns. Only 61 of 65,507 messages from those senders landed in Primary inboxes. That’s less than 0.1%. The bottom line: “move me” campaigns are a complete waste of time. Despite all this, you might be wondering in which Gmail tab your emails might go into. Or maybe you don’t have a Gmail inbox yourself. Gmass is a free tool that allows you to test if your email goes into the inbox, spambox or the Promotion tab. You can import this .CSV to your own MailPoet to send a test newsletter to Gmass’ email addresses. Once you have sent, simply visit their website. Gmail’s Promotions tab is not worth fighting. In fact, as the research clearly shows, it can help bump up your engagement and open rates, and capture subscribers in the right place at the right time when they’re ready to convert. Ultimately, the best thing you can do for your email marketing campaigns is send high quality, engaging, and well-timed content to a clean list of contacts. If you’ve spent time building lists of subscribers who trust you and have opted-in to your emails, then Gmail’s Promotions tab is exactly where subscribers will expect to find your emails. Very useful information, thank you for sharing it. Gmail Promotion Tabs combined with engaged email marketing content could increase subscriber attention?